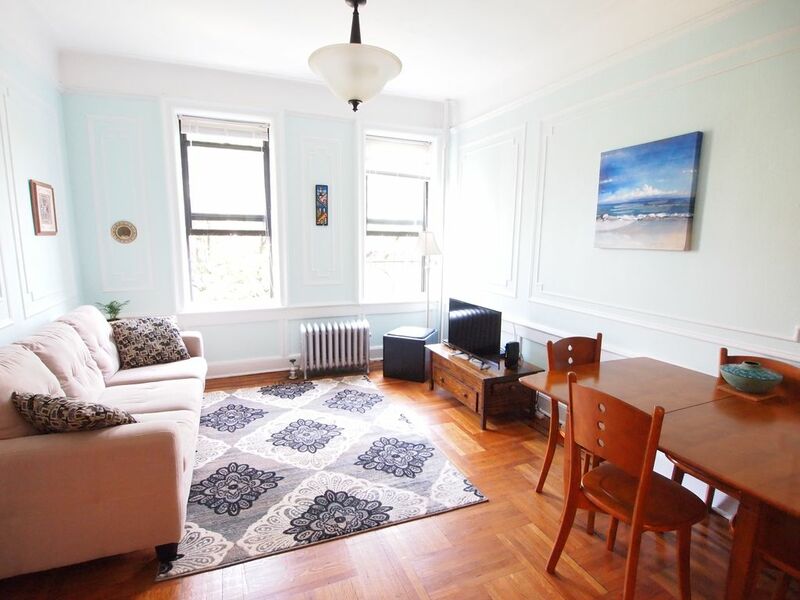 Located on a lovely tree-lined block amid brownstones, this sunny 1 bedroom apartment in a pre-war building is just a few minutes' stroll from Prospect Park, the Brooklyn Botanic Gardens and Brooklyn Museum. Get the true Brooklyn vibe in this hip and historic neighborhood known as Prospect Park Lefferts Gardens. A vibrant neighborhood typical of the amazing diversity that Brooklyn has to offer - with restaurants, bars and an array of markets and stores - you will find everything you need in the immediate area. The Brooklyn Botanic Gardens, one of New York City's hidden gems, are just a short walk from the apartment, as is the Brooklyn Museum with it's top notch art collection and temporary exhibits. Prospect Park offers great summer concerts and is a beautiful destination, especially the new Lakeside area (featuring a state of the art skating area and water park), the Boathouse, Carousel and Zoo. Take a stroll through the park to reach Park Slope, Grand Army Plaza and the beautiful Brooklyn Library. The arena at Barclay's Center is just 2 subway stops from the apartment, and features world-renowned artists in concert as well as major sporting events. The subway provides quick and easy access to Manhattan and other parts of Brooklyn (Parkside or Prospect Park stops of the B/Q/S trains, Winthrop stop of the 2/5 trains), with a direct line to famous Coney Island. The Barclay's Center concert venue and arena is also just a couple of subway stops from the apartment, featuring world-renowned artists in concert as well as a variety of sports events. Street parking is available, and there is also a parking garage 1 block away. With large windows in each room, including the bathroom, the apartment is very bright and cheerful – a peaceful retreat from the bustle of big City life. This apartment is newly furnished, freshly painted and is equipped with everything you could need to feel at home. It has beautiful hard-wood floors throughout and provides all the amenities (flat-screen tv, cable, wifi). The apartment comfortably accommodates 4 people, with a queen size bed in the bedroom and a full-size pull-out sofa bed in the living room. Whip up a home-cooked meal in the fully-stocked kitchen (oven, range, microwave, coffee maker, toaster oven, pots, pans, plates, etc) and enjoy it at the ample dining table. Note that the apartment is located on the 4th and top floor of a walk-up building (no elevator). Bedding, linens and towels are provided. English, Spanish, German, Slovene and some French are spoken. All inquiries are welcome! Welcoming. Clean. Full of light. Great neighborhood. Easy access to transportation and Prospect Park. Love the fourth floor walkup. I loved this apartment! Very clean and well equipped for my needs. The subway was close for an easy commute into Manhattan, and I enjoy walking through nearby Prospect Park. I would definitely recommend! On a several day jaunt down to NYC, my friend and I were very pleased with our choice of this apartment. It was spotlessly clean and really bright, and great bang for the buck! The subway is close by so we could get into Manhattan in no time, but we also spent some enjoyable time exploring Brooklyn. Walking around the neighborhood and through nearby Prospect Park to Grand Army Plaza it was fascinating to see the incredibly diverse mix of people. The collections and exhibitions at the Brooklyn Museum nearby were awesome. Food and drink choices were plentiful and the neighborhood felt safe, even when we came home late at night after catching a Broadway show. We'll be back for sure! My husband and I rented this apartment for a Christmas trip to the city and felt right at home. The person who greeted us was really nice despite the fact we were considerably delayed. The apartment itself looks just as the pictures, was super clean and well maintained, with nice décor and comfortable furniture, though the building it's in is not modern and still retains some mid-century features. The bed was real comfy and the kitchen had everything we needed. There are a lot of good restaurants to choose from in the area (at a much better price than Manhattan!) and there are a few different subway lines a short walk away that we used to get around the city. It was quite cold so we didn't have a chance to explore the park too much but it must be great in better weather. Luckily the apartment was a warm space to come home to after being out in the frigid temperatures! We wouldn't hesitate to return or recommend it to friends. This beautifully designed apartment was a comfy place to come back to after a day out wandering the city. We received a warm welcome from the host and found the apartment to be spotlessly clean and thoughtfully equipped. There was an interesting and diverse mix of families and hipsters so it was a safe neighborhood in which to get an authentic feel for Brooklyn. The metro is just a few minutes walk away and there are a few lines to choose from, we found it quick and easy to get into Manhattan though we frankly enjoyed exploring Brooklyn even more and found Prospect Park to be especially lovely. There's a load of restaurants, cafes, bars and plenty of supermarkets all in the immediate vicinity of the apartment- plenty of options whether you want to go out or eat at home. Def. recommend as a wonderful alternative to staying in Manhattan! The apartment was nice and clean. The hosts were very prompt in responding to and greeting us and taking care of check-out on the other end. It is too bad that the landlord (not the hosts) does not take more care with the rest of the interior of the building. If you stay, learn to ride the bus up and down Flatbush Avenue as that is the most expedient way to get anywhere. It was very nice that the grocery story is less than a half block away to save on food costs and we especially enjoyed the Indian Restaurant right around the corner. The multiple locks on the doors are great for security, but I found them challenging and was glad my teenage son was with me (I gave him that job!). There is no elevator that I saw and so be prepared to haul everything up and down the four floors. Its a perfect bit of exercise if you aren't too tired. Was not necessarily sure I would have felt comfortable with staying at the location by myself though neighborhood is clearly in renaissance. To confirm the booking, the guest whose credit card was used must provide a copy of his/her identification (passport or national ID card). On arrival, the reserving guest must show the original identification document and the credit card used to make the booking. Failure to provide this information will result in termination of the stay in accordance with the property's cancellation policy. This is our family home, so guests are expected to treat it with respect and leave it in tidy and good condition on departure. Please remember that NO SMOKING is allowed and no parties or large gatherings are permitted. Only guests who form part of the reserved party can stay at the property. For stays longer than 1 week, the host reserves the right upon notice to enter the property for an inspection. By booking the apartment, guests acknowledge that failure to observe these simple rules will result in termination of the stay and forfeiture of the rental fee & deposit. Deposit acts as security against any damage that might be caused to the apartment or furnishings during the stay. It will be automatically refunded by HomeAway upon an inspection of the apartment, so long as the apartment is left in the same condition it was found. Check in / out between the hours of 11pm-8am incurs an additional $35 charge. Cleaning service is available upon request during the stay for an extra fee.